In large saucepan, combine ground beef, onions and bell pepper. Cook over medium heat for 8 to 10 minutes or until beef is thoroughly cooked, stirring frequently. Drain. Stir in all remaining ingredients. Bring to a boil. Reduce heat; simmer 15 minutes, stirring occasionally. 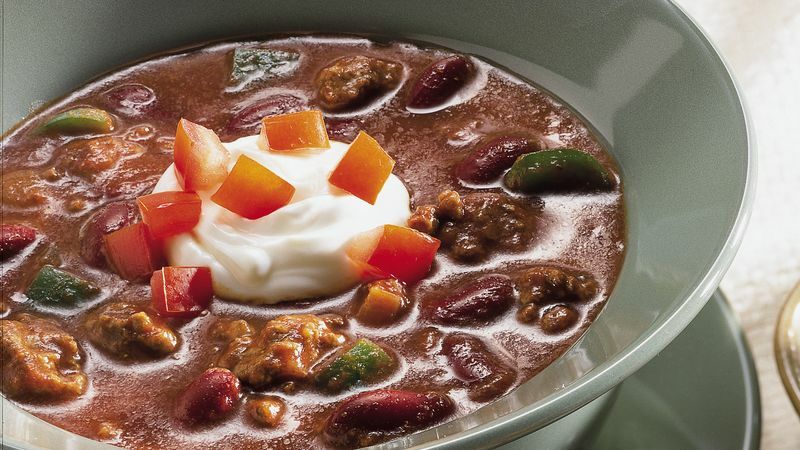 Everyone needs a quick, easy chili recipe in their back pocket, and you should make it this one! From start to finish, this recipe is ready in just over a half hour and is all made in one pot—that means no dirty dishes or hangry kiddos in your kitchen. This recipe calls for ground beef, but you can easily swap this out for ground turkey, if that’s your family’s preference. When cooking the ground beef, you will need to drain the grease before continuing to cook in the same saucepan. When draining the grease, don’t pour it down your sink! That can cause some serious blockage problems in the pipes. Instead, pour it into a bowl or container and wait for it to harden, and then throw it in the trash. Now that you know how to make the easiest chili, try some fun twists on the classic dish next! And make sure you read this article before you start cooking, which contains all of our kitchen-tested tips and tricks for making the very best batch of chili.